I’ve enjoyed Cake’s music for many years but I really got into them when my friend Andy and I started listening to the song “Nugget” in order to get through some frustrations we were having with a project for work. But the first time I actually saw them in concert was at the Outside Lands Festival and it was fantastic. So when I saw that they were doing a show at The Independent in San Francisco I simply had to go. For those of you that aren’t familiar with The Independent, it’s a smallish venue that holds, by my guess, about 300 people. There is a regular stream of good artists on their calender, but getting to see a band like Cake in such a intimate setting doesn’t happen very frequently. Even at $50 a ticket the show was a bargain considering the experience. Speaking of money, the reason Cake was putting on such a special show was to raise money for Proposition H which is on the ballet this November in San Francisco. If it passes, San Francisco will become the first city in the U.S. to be 100% powered by clean energy sources. Cake has a long history of finding creative ways to help environmental causes and it’s one of the reasons I love their music so much. Naturally the place was packed and the crowd was fantastic. Very enthusiastic and clearly big fans. The set was almost two hours long which is amazing considering that John McCrea (lead vocals) was feeling a bit under the weather with a sore throat. But this fact didn’t seem to get him down much as he frequently addressed the crowd, interacting with us, asking us questions, making us laugh and (in typical fashion) giving away a tree. This show was so unique that it’s really impossible to truly describe in words. But thankfully I did manage to get a couple videos that at least give you a feeling for how personal the setting was. Take a look and be jealous if you weren’t there :). 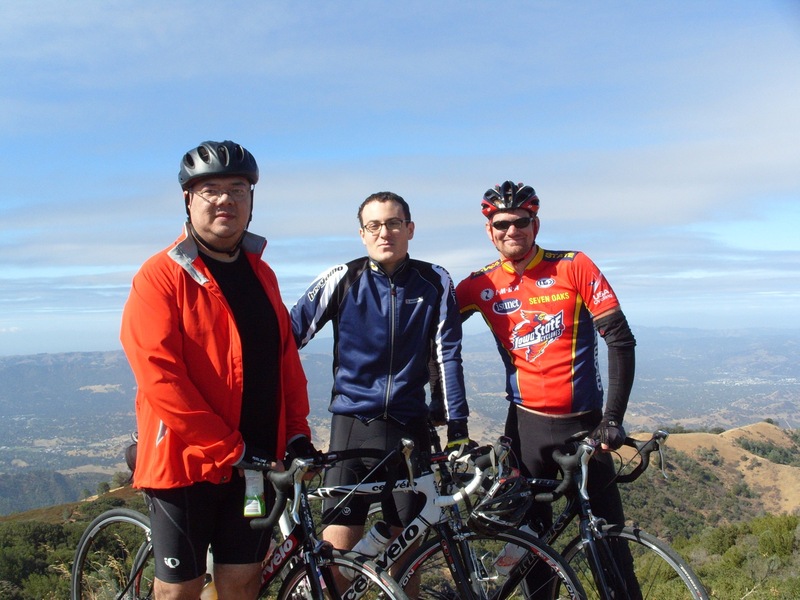 A couple months ago Evan talked both John and I into signing up for the Mount Diablo Challenge which is a road race up Mount Diablo with the goal of raising money to protect the mountain. 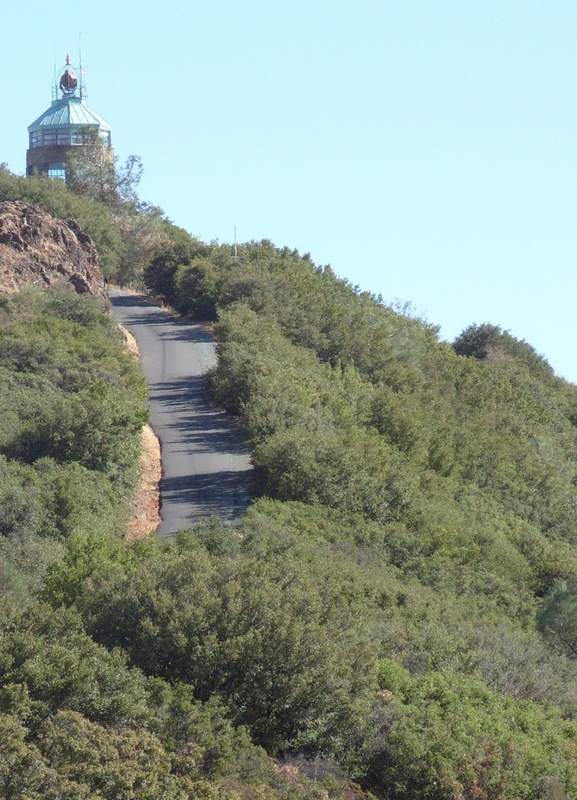 To get to the top, cyclists have to ascend 3,250 feet over a winding 10.8 miles with roughly a 18% grade for the last tenth of a mile before the finish line. 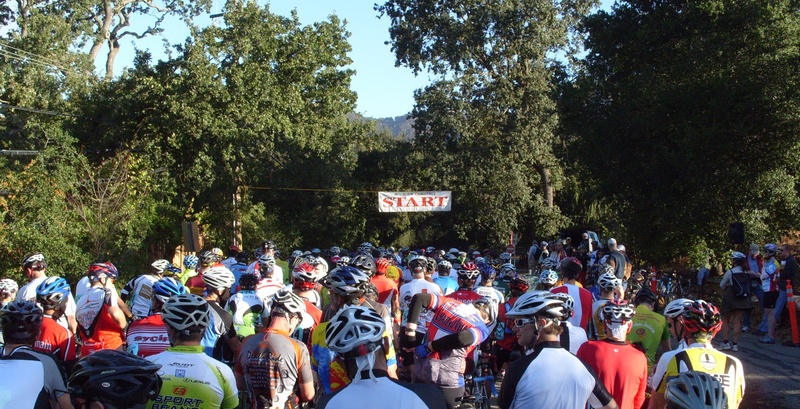 This year roughly 1,000 cyclists participated in the race and a new record of 41 minutes and 19 seconds was obtained by Howard Love. But you don’t have to be anywhere close to that fast to feel at home going up the mountain because the race attracts all types of cyclists including very young children, mountain bikers and unicyclists. Because the three of us are at fairly different levels of fitness we sadly couldn’t be in the same starting wave. Being the fastest, Evan was in the second while I was in the third and John was in the fourth. Evan’s goal was to finish in under an hour, I wanted to get in at 1 hour 20 minutes and John wanted to make it to the top. The day was sunny but rather cool overall with some significant winds on the upper half of the mountain. I was feeling pretty good for the first 6.5 miles of the race. I’d ridden this section of the road before which really helps with the mental aspects of a race. However the last few miles of the ride required an increasing amount of mental tricks to constantly push out the fact that I didn’t totally know what was ahead of me. I was actually quite confident that my time was nowhere close to what it needed to be in order to accomplish my goal so I forced myself not to look at the clock in fear that it would be depressing. However, in retrospect this was actually a mistake because in reality I was actually doing quite well. I discovered this after I crossed the line and to my complete surprise I had managed to finish only four minutes behind my goal. While it would have been nice to meet my goal I’m still quite happy with my results given how little training I did for the race. As for Evan and John, I couldn’t be happier for the two of them because they both accomplished everything they wanted to with the race. Evan finished in exactly one hour and John crossed the line in under two. Earlier in the year Evan was doing the math for how much more energy he would have to pump out in order to make it in under an hour which to me seemed like it might not be obtainable. Even more impressive is the fact that prior to the race John hadn’t made it to the top of the mountain at all. Congratulations to both of them. Next it looks like we’re going to do some of the climbs in the low key hill climbing series, we’ll see how they treat us. One of my favorite John Vanderslice songs is titled “Me and My 424“. The song is all about his love and attachment to his Tascam 424, which is a 4 track recorder. This song was the first thing that popped into my head when I sat down to write this post and it was too perfect of a connection to ignore. For those of you that got this reference, congratulations on your good taste. For those of you that didn’t, you should really brush up on your bay area indie artists. This last weekend I attended the Austin City Limits Music Festival and sadly two of my best friends couldn’t attend the festivities. So I figured the next best thing to being there is getting to hear live recordings from some of the sets. I’d never done any recording so I knew the chances of me getting something of quality wasn’t likely but worth a shot. Plus, the endless string of shows over three days would allow me to cram a ton of learning into a short time frame. Before making my purchase, I did some research online. I managed to find this fantastic article by Mark Nelson on the O’Reilly Digital Media site comparing the M-Audio MicroTrack II to the Edirol R-09HR. Mark leaves it up to you to decide which recorder best fits your needs and it was the 48 volt phantom power on the MicroTrack II that sealed the deal for me. That and the fact that I found a brand new recorder on CraigsList for only $225. 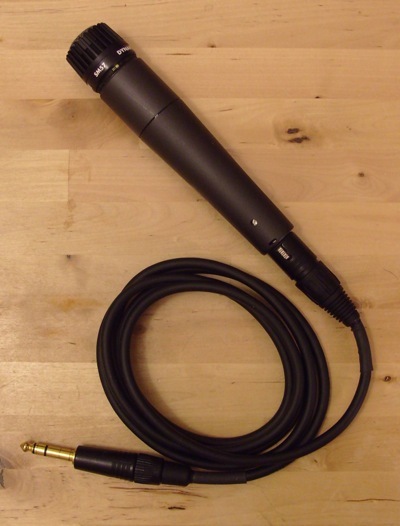 The MicroTrack II came with a simple stereo microphone that seems to be of good enough quality for unplanned recordings, but my desire for better quality required the use of a nicer mic. A few weeks prior I had purchased a Shure SM57 dynamic mic to play around with and I wondered what kinds of results it would produce. So I picked up a TRS to XLR cable to go from the MicroTrack to the SM57 and did some test runs using my home stereo. Right off the bat I noticed that the mic that came with the MicroTrack was much more sensitive than the Shure. I wasn’t sure which one would do a better job at the festival so I decided to take both and experiment. Ideally in this situation I’d have a nice condenser mic but I didn’t know how much I’d enjoy making the recordings and I didn’t want to dump more money into this if it wasn’t going to yield any pleasure. Fortunately I found out quite quickly that the stages at the festival were loud enough to drive my dynamic mic and I left the small clip on mic in my bag for the rest of the weekend. Austin Texas tends to be fairly hot this time of year and while recording, the MicroTrack actually generates a little bit of heat on its own. The first set I recorded was Yeasayer and things went off without a hitch. I kept an eye on my levels throughout the show keeping them low enough not to clip. After the set I wanted to listen to the recording in a bit quieter setting to get some immediate feedback. I started playing the track back but to my surprise, I couldn’t adjust the volume on the headphone output. This had me a bit worried so I decided to power cycle the recorder. The combination of the heat from the sun and the internal heat that the recorder generates was clearly upsetting my new device because after turning it back on, it immediately turned itself off. After biting a couple fingernails I decided to let it sit in the shade for a while to cool off with the hopes that it would come back to life. It did. For the rest of the afternoon I continued to play around with various settings and was quickly finding myself very comfortable with the layout of the device. It’s operation is really straightforward with a minimal amount of buttons and only the ones you need quick access to. My first real complaint was the fact that when recording from a mono source (left channel only) you only get audio in the left channel of the headphone output, even when setting the recorder to mono mode. This seems like an oversight on M-Audio’s part, making it slightly annoying. The last set I saw on Friday was Donavon Frankenreiter and I so desperately wanted to get a good recording of what I knew would be a fantastic show. I managed to get a great spot on the right hand side of the stage and it felt like a pretty good place to setup shop. At the end of the set we headed back to the hotel and I got my first chance to hear what I had captured in detail. It was amazing, I could hardly contain myself. The last time I felt this type of magical experience was making prints in a dark room. The recording didn’t have the same quality as a sound board recording but for such a simple and portable setup I’m truly shocked at the results. Here’s a video that Will shot, I replaced the audio from the camera with my recording. Encouraged by Friday’s results, I went into Saturday with a lot of enthusiasm especially because Iron & Wine was playing in the evening. Once again, the recording went off without a hitch but I’m discovering that it would be nice to roll off the bass a bit before the signal hits the MicroTrack. I want to do this because some of these shows have so much bass that it’s difficult to keep the input from clipping like crazy and still capture the rest of the detail. In photographic terms, it’s a lot like trying to take a picture of something in the shadows while staring at the sun. Sunday was a big day. I wanted to get a recording of Tristan Prettyman, Neko Case and The Raconteurs. All was going well with the Tristan set when I realized that twenty minutes into the set I ran out of space on my CF card. This was confusing to me at first because I had removed all the old recordings from the previous day and my 4GB card should have had enough space for over three hours of recording. Being a geek, I had a theory for what went wrong. When deleting the files I didn’t use the delete button on the MicroTrack, instead I deleted them via the Finder on my Mac and it seems as though the files weren’t actually deleted, just hidden. The file browser on the MicroTrack only shows you audio files that it can read which in normal situations is nice. But when you’re out of space because of clutter it would be great to be able to remove that clutter while in the field. So I’d highly recommend that M-Audio adds a feature to allow you to browse all of the files on the device for these kind of emergencies. Because this feature isn’t present, I found myself running around the festival looking for a usb cable so I could hook my recorder up to one of the computers that Dell had at its tent. This was a fruitless task and I was left with no option but to reformat my CF card, loosing what I had of the Tristan set. But thankfully the reformatting worked and I was able to grab the other two. So the bottom line is that I love my new toy and I highly recommend it. It’s friendly to use, affordable, portable and produces amazing results. The only reliability problem I had was when it got excessively hot. As for features, I’d love to monitor a mono signal in both ears and be able to manage the non-audio files on the device.